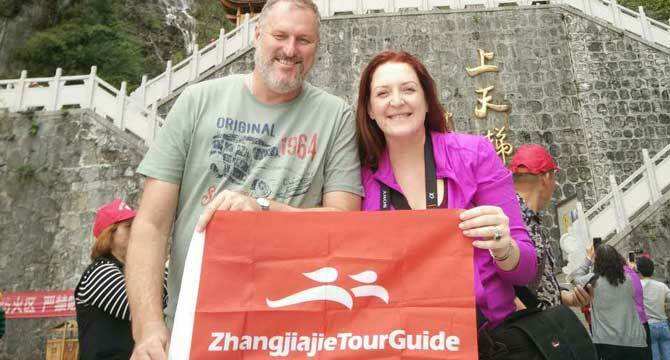 09:00 a.m. our guide will meet you in your Zhangjiajie downtown hotel (Yongding district). Then drive to enjoy a full day tour of Zhangjiajie Tianmen Mountain National Forest Park. 16:00 p.m. Head back to your hotel. Tianmen Mountain National Forest Park, commonly called Tianmen Mountain, is characterized by huge limestone mountain tablelands with sheer cliffs and jagged peaks clothed in verdure. Although Tianmen Mountain lacks the freestanding obelisks of Zhangjiajie, this place is striking in its beauty and grandeur. Tianmen Mountain is the highest peak of Zhangjiajie city and is regarded as the ‘soul’ of the scenic area. Tianmen Mountain known for its “five wonders” – Tianmen Mountain Cableway, Avenue to the Sky, Tianmen Cave, Glass Walkway, and Mountain Plateau Virgin Forest. Tianmen Mountain Cableway is the longest cableway in the world. Spans of the cableway are up to 500 meters! In some places, the road rises steeply at an angle of 70º, suddenly crashing straight into the clouds. An unforgettable experience! You can go down from the mountain by bus over the road “Avenue to the Sky” (Tongtian Avenue) with 99 sharp turns that snakes up Tianmen Mountain. The name of the road is not an exaggeration, it’s one of the most impressive mountain roads in the world. The serpentine length is about 11 kilometers, but the elevation rises rapidly from 200 meters to 1300 meters. The road is so popular that some people consider it as the main attraction of the park. Tianmen Cave (aka Gate to the Heaven) is the world’s highest cave of its kind. It was formed naturally as a result of soil erosion. It’s alleged that in the year of 263, a large chunk of the mountain just fell off, creating a huge cavity (131.5 m height, 57 m width and 60 m long). Сloud capped “Heaven’s Gate” is impressive. There is a feeling that after passed through the gates you’ll find yourself in heaven. Tianmen Mountain Temple was built during the Tang Dynasty as the center of Buddhism in the western Hunan. The modern church is a reconstruction of the original temple on an area of over 10,000 square meters. The temple is located in a mountain hollow with a broad overview. If you look at the temple from the south-east, the surrounding hills seem to be so small that the temple looks like a lord – the son of the sky. This temple is one of the major pilgrimage sites in Hunan Province. It is famous for its hanging along the cliff line of the Ghost Cave. The length of the path is 1,600m with an average elevation of 1400 m. The path starts from Yihong pass and ends at small Tianmen Gate. The path is different with others as it is not located neither on the top of the cliff, nor the side of the cliff, but in the middle of bottomless cliff, giving tourists a feeling of excitement and surprise.